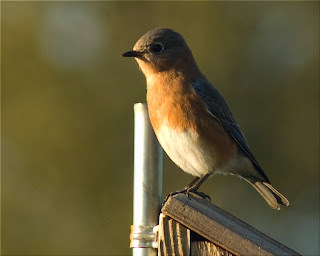 This female bluebird was drawn to the nest by the male. Apparently she liked it because nest building quickly followed. We moved to our current home about 12 years ago and started with a single nest box that was inhabited within a few days. Since then we have added boxes and have seen multiple succesful nestings every year. We have even had one of the bluebird boxes modified by a red bellied woodpecker for their nesting purposes.